Chronic Kidney Disease (CKD) is associated with increased vascular stiffness, cardiovascular mortality, and adverse cardiovascular events. Increased vascular stiffness in kidney disease is thought to be due to long standing hypertension and metabolic complications of kidney disease. However, we have shown that increases in vascular stiffness occurs early in CKD and in experimental models of CKD that are not associated with hypertension or metabolic complications.However, why kidney disease causes blood vessels to stiffen is yet to be determined. 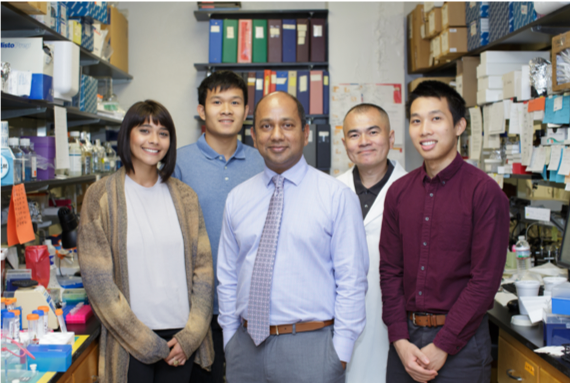 Our lab is interested in exploring the molecular mechanisms that are associated with increased vascular stiffness in kidney disease and the effect of stiffness on vascular smooth muscle cell structure and function. Lysyl Oxidase and Vascular Stiffness:We have shown that lysyl oxidase (LOX), an enzyme that crosslinks collagen and elastin is upregulated early in kidney disease and serum from uremic patients upregulates lysyl oxidase in vascular smooth muscle cells in culture. However, how much this increase in lysyl oxidase contributes to increases in vascular stiffness is yet to be determined. Lysyl oxidase is also present in immune cells and other cell types. The role of smooth muscle derived lox is also unclear. We will use mice with lysyl oxidase knocked out only in the vascular smooth muscle cells to determine the effect of LOX on increases in vascular stiffness. We are also doing experiments to determine why LOX is upregulated in kidney disease. Rho-kinase Mediated Increases in Proliferation of Vascular Smooth Muscle Cells:Matrix stiffness affects growth and differentiation of cells. 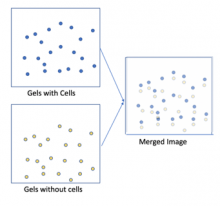 We have shown that stiffness of the extra-cellular matrix increases proliferation of vascular smooth muscle cells. We have also shown that this is dependent on the Rho-kinase pathway. We plan further studies using siRNA to confirm these findings and determine which isoform of Rho-kinase is responsible. We will also demonstrate the validity of these observations in vivo using animal models of kidney disease. Pressure Myography:We use pressure myography to measure the mechanical and vasoactive properties of arteries. An intact small segment of a second or third order mesenteric artery (Figure 1a), which is thinner than a hair, is mounted on to two small glass cannulae and pressurized to a constant suitable transmural pressure (Figure 1b). The system allows us to study changes in diameter of vessels in response to drugs and other vasoactive compounds under near-physiological conditions, where vessels retain many of their in vivo characteristics. These techniques demand patience, dexterity and exceptional hand eye coordination. Doppler Echocardiography in Mice:The whole mouse aorta is only about 2 mm wide and the mouse heart beats at 300-850 beats/min! So imaging the mouse vasculature is very challenging. 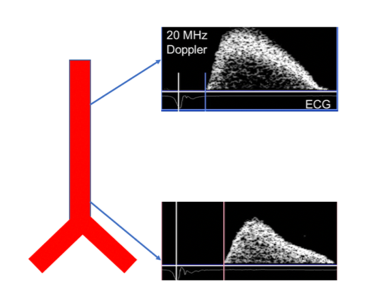 Our lab uses doppler echocardiography to measure pulse wave velocity and distensibility in mice, which are markers for vessel stiffness. Doppler wave forms are obtained from two different points in the aorta. The interval between the onset of the R wave (EKG) and the peak of the pulse wave is measured at the proximal and distal positions of the aorta. Pulse wave velocity is calculated as the distance between the two points divided by the transit time of the pulse wave. An increase in pulse wave velocity indicates increased stiffness of the arteries. We also use speckle tracking echocardiogram to measure the distensibility of the aorta, as a surrogate for vascular stiffness. .
Atomic Force Microscopy:AFM uses a probe attached to a cantilever to indent the surface of the cell to gather information about cell stiffness, structure and function. 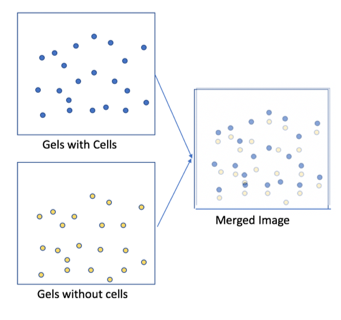 We collaborate with Dr. Anthony Brennan’s laboratory to study stiffness of vascular smooth muscle cells using AFM and how changes in signaling pathways can affect cell stiffness. Bianca Carpino (Laboratory Manager):Bianca joined the lab in 2017. She is an expert in pressure myography as well as immunohistochemistry. She also serves as the lab manager and maintains all our mouse colonies. She is a nerd and a diva who loves sci-fi, video games, art, music and fashion. Shiyu Li:Shiyu has more than two decades of experience in the laboratory. He is an expert in flow cytometry and cell culture. I-Chiua Liu (Daniel) (class of 2021) :Is a current medical student at the UF College of Medicine. Daniel is passionate about research. His focus is on how kidney disease affects calcification and stiffness of vessels. He has presented his work at ASN (2018) and the ACP meeting (2018). Daniel has no spare time. Jyoti Moorjani (class of 2020): Jyoti is an undergraduate student on a pre-med track. When she is not in the lab or studying, Jyoti loves to dance, particularly Indian classical dance. Contact Information: If you are interested in any of our current research projects and would like to join our team, please feel free to contact Dr. Rajesh Mohandas .